"Fitzgerald was the second NIU player to die in as many years"
"But his mind immediately thought back to Jawan Jackson, who was trying out for the team when he collapsed and died because of an enlarged heart Feb. 1, 2002." The first in, last out! PJ Flecks now wife used to work at fattys. I had given her my copy of teh SI for PJ to sign., never got it back. You'll get it back - he's just keeping it until he can sign it as "NIU Head Coach" - about 2018. Hmmm......a post in the "Oct 6 - 20th anniversary of the famous mugging" thread reminded me that all of the "Korcek's Corner" articles should be linked on here. It's the closest thing we have to a Huskie History book by Mike Korcek. I hope the Daily Chroncile does not remove these. I know there are more (Why Joe Novak was a success, Why we owe Wisconsin, NIU's greatest football victories and more), but I can't find them online. I saved most of these as PDFs when they were originally posted. Note to John Sahly and Jeremy Werner at the Chronicle: can you provide a link on the Huskie Wire to Mike's articles? Maybe it's there and I missed it. Thanks. The Monday after we beat Alabama, Mark Brown, columnists of the Chicago Sun Times, and alum, wrote the greatest, proudest column ever. I can't get my hands on it now. can anyone help? (10-07-2010 02:45 PM)chihuskie Wrote: The Monday after we beat Alabama, Mark Brown, columnists of the Chicago Sun Times, and alum, wrote the greatest, proudest column ever. I can't get my hands on it now. can anyone help? Email. I'm sure he'd like to hear that. I'm pretty sure this is the article. I think you have to pay a fee to retrieve the entire text. Is this the one you had in mind? The performance of a college football team has no relationship whatsoever to the caliber of the education that school provides. Most of us can probably agree on that. And it certainly follows, therefore, that there can be no connection between the outcome of a college football game in 2003 and a college degree earned between, say, 1973 and 1977. That has to be the one. How do you get it? (10-08-2010 11:31 AM)chihuskie Wrote: That has to be the one. How do you get it? I just did a quick archive search at Sun-Times.com. I remembered the article too. In 1899, Northern Illinois State Normal School opened its doors. From that first student body of 173 prospective schoolteachers to the complex university of 1974 with over 21,000 students is a giant step on the prairie, and in a sense it is an accurate measure of the social history of the Midwest. The challenge and change in the story of Northern's growth and development keeps pace with the region and its people. The invention and production of barbwire—the wire that fenced the West—brought business and money to DeKalb; three barbwire kings fought and won the battle to have the new Normal School located in DeKalb. In the beginning, the educational philosophy emphasized the training of prospective teachers and the practical management of the classroom rather than the more traditional education in the liberal arts; and, as teachers were seen as model human beings, the students were heavily indoctrinated with the mores of rural, midwestern protestantism. The monarchial reign of President Cook has given way to a democratic process—now, an undergraduate sits on almost every important board. The two-year certificate granted by the fledgling Normal School has been surpassed by ten doctoral programs (six in liberal arts and sciences and four in education). And although the campus's first building reflects then Governor Altgeld's conviction that an educational institution should look like a castle on the Rhine, forty-five buildings later the architecture of the new library building embodies the needs of a multiversity with the spirit of urbanization. Professor Hayter has written a history and not a public relations puff-piece. As President Nelson notes in his foreword, "It is honest and candid. The warts and blemishes are all there." As a living university is not buildings and budgets but human beings with ideas and convictions, so this chronicle of Northern's first seventy-five years breathes life. Earl W. Hayter, 93, a historian and professor of history at Northern Illinois University, saw the school move from a teacher's college to a major university. He was the author of "Education in Transition," a 541-page history of NIU. A longtime resident of DeKalb, he died June 8 in the Oak Crest-DeKalb Area Retirement Center, where he had lived since 1983. Professor Hayter wrote a manuscript that was sealed until after his death. Glen Gildemeister, a historian and director of the Earl W. Hayter Regional History Center at NIU, has opened and reviewed the work, an autobiography titled, "From Claim Shanty to the Halls of Ivy: Sketches of an American History Professor." His autobiography tells of his being on an Ohio farm and of the family moving to a prairie homestead on the plains of North Dakota, where he attended one-room elementary schools. After high school, his story continues, he worked as a railroad laborer and a telegrapher. He then lived for a while among the Crow Indians. Professor Hayter earned a bachelor's degree from the University of Nebraska, a master's from the University of North Dakota and a doctorate in 1934 from Northwestern University. Two years later, he began his career at Northern Illinois State Teachers College. Profesor Hayter, who won excellence in teaching awards at NIU, also wrote: "The Troubled Farmer, 1850 to 1900." Professor Hayter represented "a rare combination of humility, integrity, ambition and old-fashioned grit," Gildemeister said. Survivors include a daughter, Mary O. Harmon; and three grandchildren. Great book - see article on page 8 of this PDF. I bought my book at the store at the Convo. the sale of Castle on a Hill will go to the library endowment fund. Village Commons Bookstore, the DeKalb Gallery, and on Amazon.com. Interesting-good find. We're #171! I plan to go back to look at other schools. UWGB games during Coach Mo's days (3 losses in the NCAA year). UIC when we were in the same conference (Mid-Con). ISU back in the McDougal years-Chick Evans was packed. SIU although I only saw a few games and the most recent was awful. As far as the MAC, probably Miami, especially when they had Ron Harper. I was at the DePaul "Terry Green dunk" game in 1979, but when they were really good it seemed like they used to kill us in Rosemont. DePaul (which owns a 22–6 series lead) has to do." This is a good one - "Huskie Football: The First Century"
Check out the picture from the 1965 dedication game at Huskie Stadium. I wrote in the Jack Coffman thread that this reminds me of the Matt Hicks Pizza Hut Classic write-in campaign in 1977. Huskie fans really rose to the occasion for Matt and are rising again for Jake. I wondered if anybody remembered it, and got some response. So I thought I would post this in the "Huskie History" thread so all our young Huskie pups can see what we accomplished (and the rest of us can relive it). 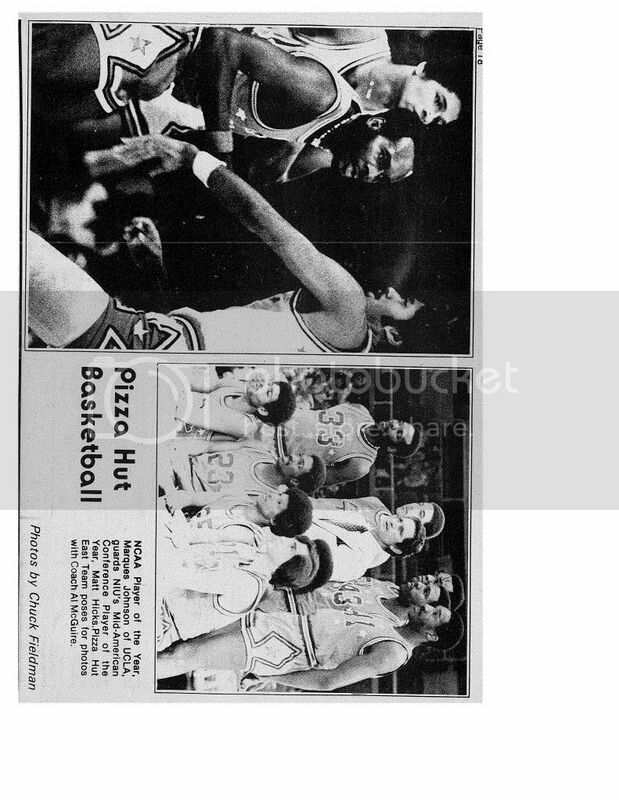 Pictures from the April 12, 1977 Northern Star with legendary coach Al McGuire, Marques Johnson and others. I believe #23 in Mike Glenn from SIU, #41 might be Walter Davis. I remember it well. We were asked to write his name in, and mark the names of three other guys who were shoe-ins since you had to vote for a minimum of four guys on both the "east" and "west" squads. We'd pick up stacks of ballots from Sports Information and write his name in. Almost everyone I knew filled out hundreds of ballots, and we pulled off the largest write-in campaign I can ever remember. 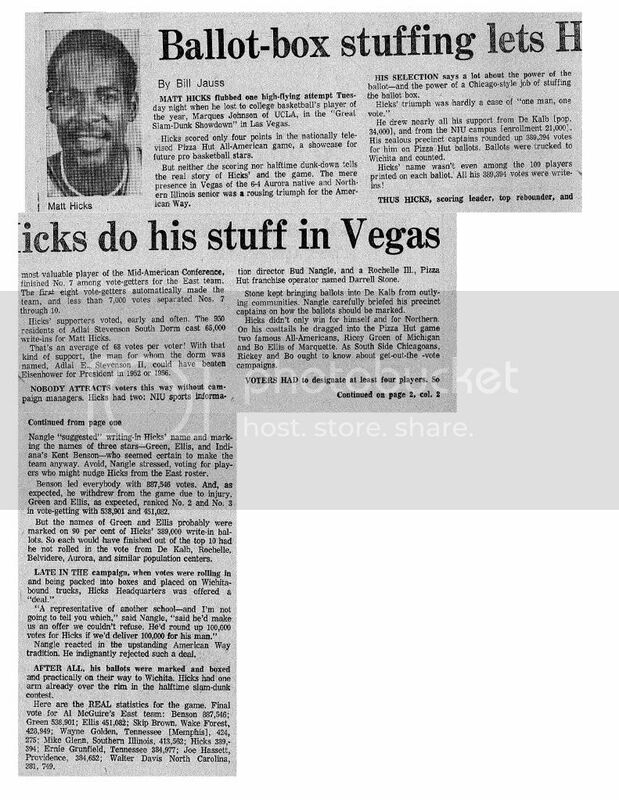 I also remember the Rockford TV station carrying the all-star game (I want to say it started at about 9 o'clock seeing as it was played in Las Vegas) night and Matt being introduced to the television audience as "Matt Ricks". He also participated in the slam dunk contest at half time and proceeded to miss his first dunk attempt. The memories. Yes I remember the Matt Hicks write in campaign for all-america basketball game. That was the Huskie spirit. He's moving up fast. While the other two ahead of Jake seem like fine young men, their accomplishments do pale in comparison to Jake's. We can not be out done by the Naval academy. Let's pour it on, contact family and friends and don't stop till we win it for Jake. GO HUSKIES!!! John McDougal, ex-NIU men's head basketball coach (1976-86): "Bud Nangle was the consummate SID. I had nothing but the highest regard for him as an SID and as a person. He was a tremendous source of encouragement and professional counsel for me. There's no question that had it not been for Bud, Matt Hicks would have never had the opportunity to participate in the Pizza Hut Classic. Thanks to Bud and the campus community, Matt garnered the largest amount of write-in votes (a record 389,394 in 1977) in the history of the game. It was a great campaign for a deserving player and Bud Nangle pulled it off." This is such a wonderful column. NIU's history is very important. Thank-you NIUACCY1976 for the time and love spent and future time spent on this remarkable thread. In my opinion the most important thread. I would love to see a 1 credit hour NIU FB elective established encompassing NIU FB history and rules of the game. So with some time left in the 4th quarter, the stadium actually began to FILL UP. Apparently the game was being broadcast in the dorms and on a local Comcast / Fox Sports (maybe CSN, but I don't think so) and the students could sense the W. My group of friends who had been at the game, and who had been at almost all the games even during the losing streak, made our way to the NW corner of the stadium, fully expecting to rush the field. Again, some parts of my memory are a bit fuzzy, but let's say that items marked with an * are honest to Huskie truth, anything else could be mis-remembered, maybe embellished by history, or a bald faced lie. Well, actually nothing will be a lie. But if you read something that you know ain't true, call it out. Now, we not only had to get over this fence, but there was another waist high fence in front of the old bleachers. By this time, some members (who will remain nameless to protect their jobs) of the Athletic Department were stationed between the goal post and the fence, giant grins and all, pleading and yelling with us to not go on the field until the game was over. They knew what was going to happen, and I'll be damned if they weren't going to be involved as well. So with a couple seconds left in the game, we pounced. The game definitely had not ended, but there were only seconds left. *And me, little ol' Lord Stanley, was first to the goal post in the north end zone. They had removed the padding and I hit it hard. Now, obviously, as a proud NIU student with no experience in goal post shredding, I hugged the post with all my might, not really sure what to do next. Well, the huge crowd behind me made up my mind for me. *The crowd lifted me quickly up onto the upright. No joke, that was me. First on the goal post. Confirmed when I walked into Lord Stanley's that night and the whole local crowd told me they saw me on TV. In addition, (fuzzy here, sorry) I believe the front page of the Star had a picture of the crowd on the field, and you can see me on the goalpost, sort of hanging down like a wet monkey. *The post snapped at about the point where the curve of the goalpost goes from straight to the horizontal post. It cracked and split like how an empty paper towel tube pulls apart, if you know what I mean. Not a straight break, but more of a spiral. And the metal was sharp. So we all get the post down and in our hands, and beginning to parade the posts out of the stadium. I don't remember how we got it out of the stadium, but this part is clear as day - *we were on Lucinda, just east of Chick Evans, west of VCB and maybe 20yards south the Annie Glidden stoplight when a lady in a small white car encountered our goal post parade. Nothing stopped us; the crowd lifted the post above her car, and continued down Lucinda. One bad thing here, a lot of jakeasses where ripping up signs etc. So this huge group of students and fans, carrying a giant yellow goal post, march down Lucinda to Gilbert Way. We reach the lagoon and a select group of courageous individuals (no way I was going in the lagoon) manage to plant the goalpost lopsided in the lagoon, surrounded by many of the signs also uprooted on our journey. The day ended when the people in the lagoon started throwing mud at all the people watching – that’s when I headed to the bar…..
Memories. Man I would give your left nut to see some video and the Star articles from that day. Wait, I do still have something from that day. I have red long sleeve shirt I was wearing at the game. If someone, anyone, has a copy of the game, or the (possible) Star photo from that day, I can prove it was me by showing you the shirt! Here's an essential story about the 1983 team!